Do you wake up from the nightmare that your roof has caved in during a heavy rainfall? If you’ve ever experienced a roof leak in your home or place of business, then you know just how stressful it is. As a homeowner, you value your belongings, your family’s health, and the safety that a home can and should provide. That’s why having a stable and safe roof is so vital, because without it, your entire family is at risk. Allow our roofers in Dublin Ca to keep your family safe and protected from the elements. Whether you’re looking to have your roof inspected for leaks, or interested in installing a new skylight in your kitchen, Our professional team can help you make the home that you’ve always wanted. Move all of your valuables away from the leaking water. Place a bucket or trash can below the leak. Call a professional roofing contractor in Dublin right away. When the rain stops, place a tarp over the leaky spot in the roof. Remember to always be careful when attempting to stand on a damaged roof – you never know how structurally sound a water damaged roof might be. If your roof has suffered severe storm damage, we recommend that you leave all repairs to a professional roof repair team. We have the safety gear required to navigate your roof and avoid injuries. Do you own a home or business in Dublin or the surrounding area? Element roofing can cover both your commercial and residential roofing needs. Whether you own a small one story home or a two story mansion with a mother in law unit and storage shed, we can provide you with reliable roofing repair and inspections. And you’re in luck, because we offer free roofing estimates to all of our customers. This means that you can obtain an accurate pricing estimate and discuss payment options with us before feeling obligated to go through with any roofing procedures. The roof that sits on top of a business or office is actually a crucial part of your day to day business. Not only does it help protect your employees and clients, but a well constructed roof adds a great deal to the overall look of your building. It is the 21st century, and people tend to research online extensively before selecting an establishment to do business with, so they will already have an initial impression of your business before they even start driving. You want to preserve every positive impression they have, so they approach your office or storefront feeling excited. A dilapidated, leaky, or poorly constructed roof could immediately send negative vibes to your potential customer. 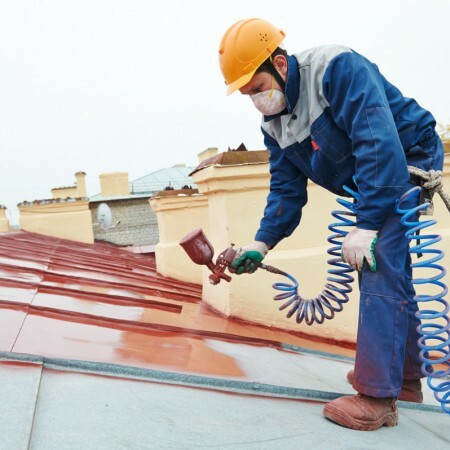 Element Roofing commercial roofers in Dublin are trained to perform annual inspections on all commercial roofs so that safety and presentation is preserved. These annual inspections can help catch small problems before they turn into larger, expensive problems. One small leak that is hardly noticeable just needs a short amount of time to turn into a whole mess of problems including new ceilings, new floors, or mold repair. Spending money for upgrades does take a great deal of planning for a business, whether you are just starting out or have been in business for decades. That is why Element Roofing does free estimates for commercial roofing in Dublin. We promise to deliver honest and upfront estimates, and a 15 year work warranty, so that we can be your partner for your roof. Title 24 was passed in California by the California Building Standards Commission in an effort to make all new homes produce zero net energy by 2020, and all commercial buildings at zero net energy by 2030. While Title 24 does not specifically apply to roofs, they are an integral part to the amount of energy your home consumes. For instance, when it is hot outside, that amount of heat that gets into your home or business can vary depending on the type of roof. The hotter inside, the more likely you are to crank up the air conditioner. Not only does this consume more energy, but it also can add digits to your electricity bill. Homes and businesses that are compliant to Title 24 can expect to save up to 28% on energy costs for lighting, heating, cooling, ventilation, and water heating. Upgrading your roof to Title 24 standards will reduce the amount of upgrades you could need for the rest of your home or building, and allow you to save even more money. The best way to bring your home or business to the standard outline in Title 24 is to upgrade your roof to a cool roof. A cool roof in somewhat exactly what the name implies, a roof that makes the inside cooler and also looks super cool. They absorb less heat and reflect more light from the sun as they are made with reflective tiles or shingles, a sheet covering, or we use a highly reflective paint. While a cool roof definitely helps your home or business fit in with Title 24, it is not always necessary. If you are no air ducts in your attic, a radiant barrier in the attic, or at least R-30 ceiling insulation, you actually might not need to upgrade to a cool roof. Have Element Roofing provide you with a free estimate and we can guide you to making your Dublin home or business Title 24 compliant. When it comes to upgrades or repairs for a roof, homeowners and business owners alike understandably brace themselves for the sticker shock. It needs to be done, so it is usually not something that can be put off for a rainy day or else you might find yourself with a bigger, more expensive repair. For that reason, you need a Dublin roofer you can trust and that will stand behind their work. Our goal at Element Roofing is to work with our clients, not just for them. We care about the longevity of your roof and want you to feel like you can trust our work. That is why we offer free estimate, a 15 year warranty, and also maintenance packages. Our maintenance packages will insure the life of your roof and catch any small repairs before they turn into large problems. Usually, a small imperfection of a roof does not even show signs of its presence until it is too late. Simply call Element Roofing and we can patch up any small problems and perform regular maintenance to keep your roof lasting. You could drastically increase the life of your roof with regular maintenance, which saves your thousands in roof repairs and replacements. Element Roofing is your top choice for roof repairs and replacements in Dublin, CA. Contact us by calling 925-301-8475 to speak to one of our friendly customer service agents. They are standing by to take your questions and to schedule your free estimate. Check out our blog for expert advice and suggestions for all your roofing needs.